Do you love Britain? Let others know! A perfect summer’s walk of ten and a half miles, which includes sea swims from sandy beaches. From Kirby Cross station, footpaths lead through open countryside, past the village of Great Holland, all the way to the sea. All along the shore, the swimming is exceptional. The beaches are sandy and pleasant for sitting on at low tide. There are numerous cafés and pubs in Walton-on-the-Naze for post swim refreshments too. The Malvern Hills in western Gloucestershire rise suddenly and steeply affording views out of proportion to their modest height. Much of the river Avon is navigable; the water is always deep and there are no problems with access. Up to Warwick the river is wild and beautiful. A deep, wide corner pool beneath cliffs can be found at Marlcliff, Bidford-on-Avon. The best swimming spot is a mile’s walk downstream from Bidford or signed Marcliff from B4085. A nine and a half mile walk, starting at Shepreth train station, across stretches of East Anglian farmland, passing through several attractive villages, via Grantchester to Cambridge. The River Cam can be followed all the way into Cambridge City Centre, with the walk ending at the train station. You can swim in the River Cam, a clear river with a modest current. The river offers scope to do a long swim downstream from Grantchester all the way to Newnham. The deep remote valleys here are rich in river pools. 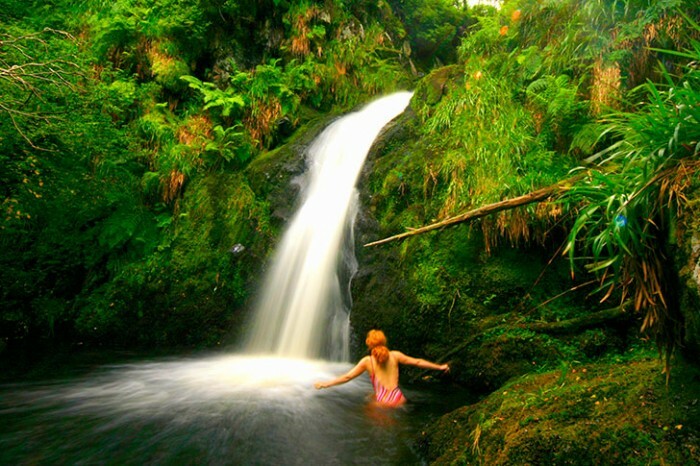 The best-known pool in the area is Linhope Spout on the Breamish, renowned for its unfathomable depth. Popular with walkers and families cooling off in the summer, there is a fun six-foot ledge from which you can jump. There is also paddling in the shallows of the beck. From A697 (between Wooler and Rothbury) follow the signs to Ingram / Breamish Valley (3 miles) then on to the end of a public road. 1¾ miles by foot through a hamlet, onto the open moor and follow the signs to the spout on the right. This 8 mile walk crosses heathland dotted with pretty Surrey villages before dropping down to follow the Wey Navigation, where there are many swimming places. From Chilworth station, the route crosses a mixture of wild and rather forbidding heathland, but soon gives way to gentle pastures, small woods and cosy commuter villages. The swimming is good with sandy beaches. Wild Swimming Walks: 28 lake, river and seaside days out by train from London by the Kenwood Ladies Pond Association (Wild Things Publishing, £14.99) is available here.